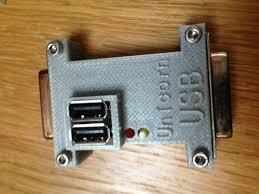 Here you'll find details on what to order for your Unicorn-USB setup. The Unicorn USB adapter is an ACSI -> USB adapter for the Atari ST/STE/MegaST/MegaSTE and TT computers. It plugs into the ACSI port and has a passthrough ACSI port for connecting your traditional devices. TOS & FreeMiNT drivers are available at FreeMiNT. NOTE: If there are any questions on the operation of the board, please use the Atari Forum so others can benefit from the answers. Thanks !! Please allow upto 6 weeks for delivery.